Chase Stevens/Las Vegas Review-Journal Boats docked at Las Vegas Boat Harbor at Lake Mead National Recreation Area earlier this year. National Park Service officials are seeking comments from the public about what should be done if water in the lake falls to low levels. The service is developing a low-water plan to address access and infrastructure issues should the lake’s surface fall another 130 feet to levels never before contemplated. The document and related environmental impact statement now under development will identify the steps necessary for continued operation of each of the lake’s access points. The surface of Lake Mead now sits at about 1,082 feet above sea level. The latest projections from federal forecasters say it could drop to 1,069 feet by July 2019. The park’s current low-water plan addresses management down to a lake elevation of 1,050 feet. The new plan would extend those management directives through another 100 vertical feet of water loss, down to a surface elevation of just 950 feet, with an emphasis on maintaining current amenities and access to the water to the extent that funding and the physical landscape allow. “Everything that we’re proposing is quite difficult,” said Chelsea Kennedy, spokeswoman for Lake Mead National Recreation Area. 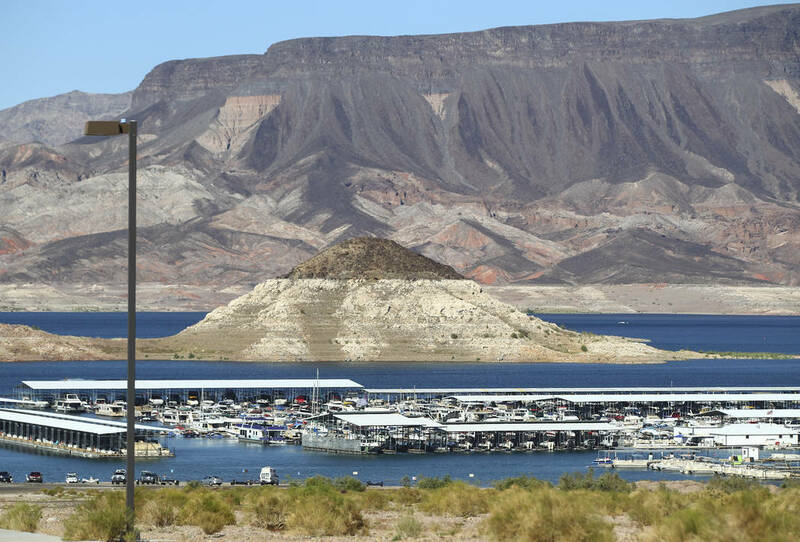 Since the drought began on the Colorado River in 2000, the surface of Lake Mead has dropped more than 130 feet, forcing the closure of three boat launch ramps and three marinas. During that time, the park has spent well over $40 million to extend other ramps, roads and utility lines; build new parking lots; move docks and navigational aids for boaters; and mark new hazards on land and water. Should the lake’s surface elevation fall below 1,075 at the start of any calendar year, it would trigger a first-ever federal shortage declaration and force Nevada and Arizona to reduce their Colorado River water use. After several meetings in the community, the Park Service is accepting public input on what should be included in the low-water plan through Nov. 5. The National Park Service is seeking public input as it develops a low-water plan for Lake Mead. Written comments and recommendations on what should be included in the low-water plan will be accepted through Nov. 5 online at http://parkplanning.nps.gov/ or by mail to: Lake Mead National Recreation Area, Compliance Office, 601 Nevada Way, Boulder City, NV 89005.